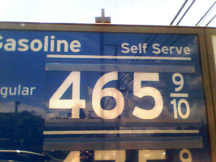 Although they (the media in Oahu) say that Hawaii no longer has the highest gas prices in the country (lowest at $3.47) and that California now has the highest gas prices in the nation (about $3.53), Maui gas prices really are. Maui prices for regular gasoline are currently $3.98 to $3.99 (at time of this writing). Soon we expect to be over the $4 mark. In all of Hawaii, Maui leads the way in high gas prices, even over Kauai, the most remote of the Hawaiian islands at 108 miles from Honolulu - the main port for Hawaii. High gasoline prices in Maui affect the price of everything in Maui, from the cost of electricity, to the cost of your wedding bouquet and dinner at a restaurant. The average price of milk is $8 per gallon, since it has to be flown in from Honolulu. And now with the closure of Aloha Airlines, the cost of goods being flown to Maui is increasing. And why did Aloha Airlines fold? Why, the cost of fuel of course. 81. NORTHEAST WINDS 10 TO 15 MPH. CHANCE OF RAIN 40 PERCENT. 59 TO 69. EAST WINDS 10 TO 15 MPH. CHANCE OF RAIN 40 PERCENT. .FRIDAY...MOSTLY CLOUDY WITH SCATTERED SHOWERS. HIGHS AROUND 80. EAST WINDS 10 TO 15 MPH. CHANCE OF RAIN 30 PERCENT. 68. EAST WINDS 10 TO 15 MPH. CHANCE OF RAIN 40 PERCENT. .SATURDAY...PARTLY SUNNY WITH SCATTERED SHOWERS. HIGHS AROUND 80. NORTHEAST WINDS 10 TO 15 MPH. CHANCE OF RAIN 30 PERCENT. .SUNDAY...PARTLY SUNNY WITH SCATTERED SHOWERS. HIGHS AROUND 82. 69. EAST WINDS 10 TO 15 MPH. CHANCE OF RAIN 40 PERCENT.